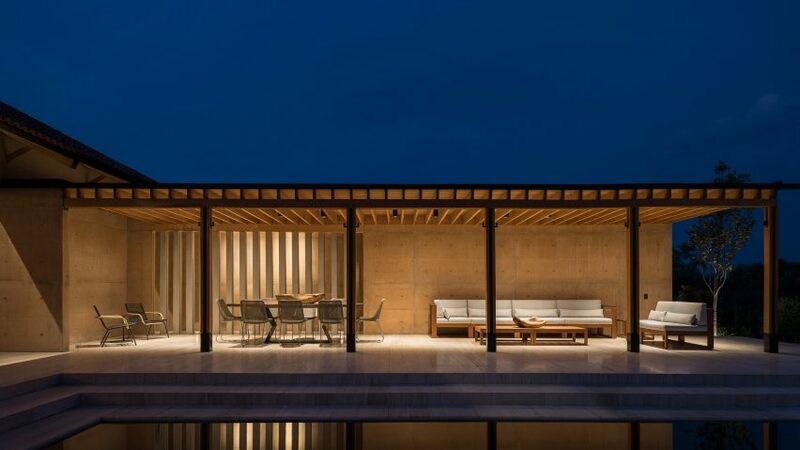 Earthen concrete walls, planted patios and pools feature in this house in Mexican state Hidalgo, which was designed by Mexico City firm Centro de Colaboración Arquitectónica. "We worked hand-in-hand with the suppliers to obtain a unique colour that corresponds to the warm tones of the site at sunset," CCA architect Bernardo Quinzaños told Dezeen. "Right now, the architecture in Mexico is about using raw materials," the studio said. "In a way that creates comfortable spaces, as with these earthy colours and getting back to the roots." "The foundation of the house stands out from the ground level, generating a skirting board that continues throughout the length and breadth of the house," said the studio. Described by the firm as "large horizontal monoliths", the two wings of the house host bedrooms. The volumes are arranged around walled-in gardens with arid plants, and a central patio with swimming pools and lounge areas. "The project is based on integrating the construction into the natural landscape," the studio said. For Casa Moulat, CCA has accompanied each of the home's bedrooms with patios, while the open-plan living and dining room is flanked by sliding glass doors. One side accesses a small courtyard, and the other side joins the pool. "The house explores the duality of open and closed spaces, inside and outside," the studio said. A lofted atrium is nestled within the roof's gable with views to the lounge. Two black armchairs furnish the elevated nook.